Loft beds are definitely more complicated than waterbeds and are used for completely different purposes compared to waterbeds. The bed resembles a bunk bed with only one-bed frame on top providing a free space below the bed frame. The space can then be utilized for different purposes. For instance, it can be used as a study area, or have a chest drawer with stools or a futon or a small sofa occupying the space. The bed frame is made using either wooden or iron rods. The beds may also contain features such as built-in storage, built-in sofa, futon or desk. Loft beds are therefore suitable for rooms with limited spaces. Since they stand above the ground, they provide more floor space. The space can be used for extra storage, plat area or a desk. Some loft beds come with built-in desks. The extra space can also be utilized by installing a bookcase, seating, and a lamp for a personal library or study area. The space can also be converted into a fort for young kids by adding a sheet or a tent. It is an excellent option for families that are still growing as you can place another bed below the elevated bed frame when the need arises. It is an excellent option for people with limited space, as the area beneath the loft bed can be used for additional storage. One can store clothes, shoes, and bins or place a dresser or shelving unit for more storage. You can also find a range of loft beds in the market with built-in drawers and shelves. As the child grows older, they transition with the bed into teen hood. You can create a study area for your teen underneath the bed. This will help prevent the child from doing homework or studying in bed. Thus the child can separate their sleep area from their workspace. Just like any other type of bed, quality matters. If you have a nice and a good quality loft bed, all you need is a good mattress such as a quality memory foam mattress. The beds are slightly expensive than most traditional beds but offer free up more space and offer extra storage options. Although it may seem costly, it is much expensive to buy a bed, storage units, and a desk separately. They are a good solution for a small room. The bed offers a good solution to people who could use an extra space underneath their beds. 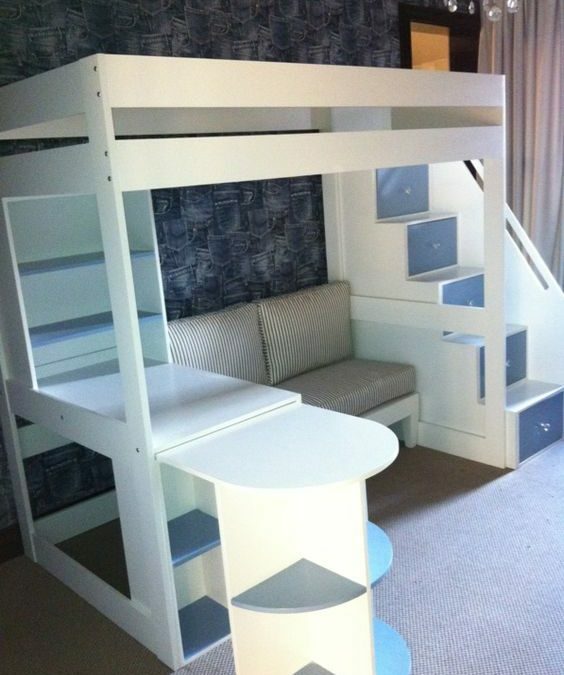 It is used mostly in kid’s room with limited space, and you need to fit in a bed and desk form them to work on. They are perfect for a small room because they provide more floor space for a desk for an older child or toys for young children. Bunk beds have two beds; one at the top and the other at the bottom. In contrast, even though there are clearly two tiers on a loft bed, there’s only one bed on it. Both beds are ideal for families that are growing as well as for adults. However, the loft bed is more suitable for adults because it has built-in shelves and a desk or a workstation.